1921 The October meeting of the W. C.T.U. was held at its usual place of meeting on Tuesday the eighteenth day of the month The president opened the meeting Mrs. [Wassar?] had charge of the devotional After the singing she read and commented on our two verses from the 54th chap of Isaiah After another songFaith of our fathers prayer was offered by the [Warden?]. Following the devotionals the secretary report was read, treas. absent. It was moved and seconded that Mrs. Kirk be instructed to publish an article commending the city council on the interest and efforts they have exercised in eliminating those things that bring reproach to the city and the preservation of Sabbath observance. A bill of $4.50 for Sunday school literature was granted and order given to Mrs. Stocks. Mrs. Watland presented a bill of .65 for Young Crusaders. Bill allowed and order issued. Mrs. Jones - a state worked gave a brief address on the sailor. their needs and what the Union could do to supply some of their needs. The song Triumph was sung-an echo from the convention. The delegates Mrs. Stocks, Mrs. Griffith Mrs [Selva?] and Kearney gave interesting reports of the convention. 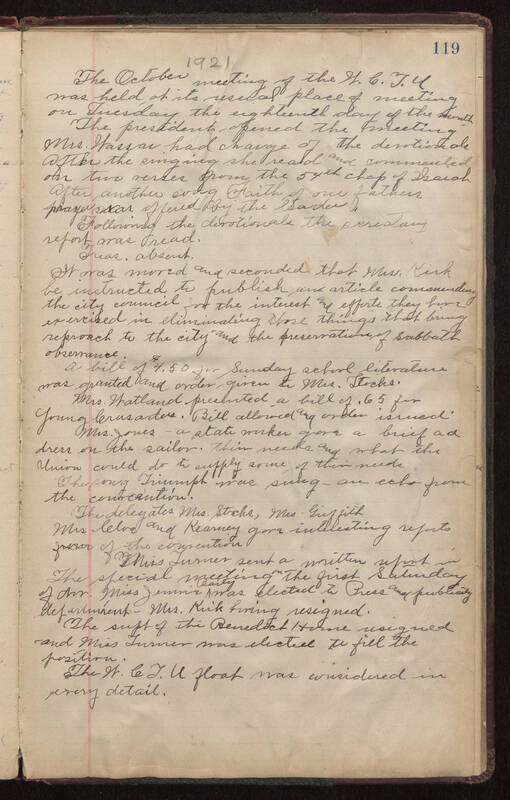 Miss Turner sent a written report in The special meeting on the first Saturday of [month abbrev.?] Miss Jennie Baily was elected to Press and publicity department-Mrs. Kirk having resigned. The supt of the Benedict [House?] resigned and Miss turner was elected to fill the position. The W.C.T.U float was considered in every detail.